Who has booked their South Coast Bike Fest accommodation yet? This is going to be the festival of the year! Don’t waste any more time, call and secure your reservation today! Regardless if you’re a biker or not, this awesome festival has something for everyone. Including a line up of world famous musicians, entertainment and attractions that will keep you, your family and friends busy all day long! If this will be your first South Coast Bike fest here is some information on the festival and some of the key attractions. The festival destination is the perfect day-trip from Joburg – under 700km – on safe biking roads. Many of the biking community stay over in the Midlands as a way to break the trip. 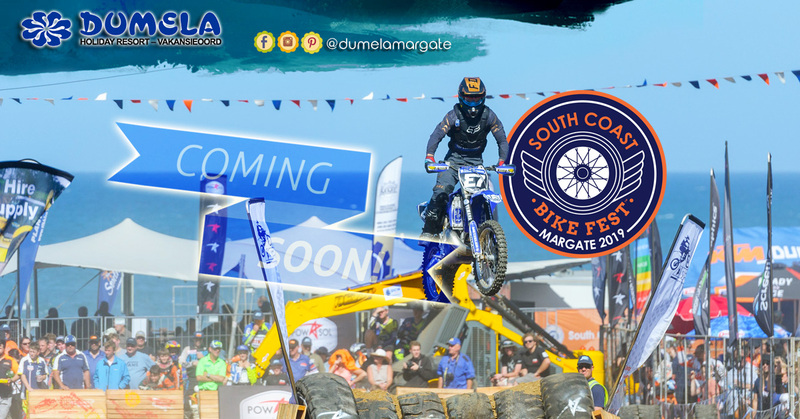 Bikers and pillions wanting to access any of the bars or stages (Main Beach Stage, Village Pier Rock Stage, Energy Zone, Reggae Bar and Jazz Bar) must pre-register online (www.southcoastbikefest.co.za) and purchase a South Coast Bike Fest 2019 pin for R35. Bikers and pillions will need to purchase a pin each. Bikers must be accompanied by their pillion to collect the pre-purchased pin at the Sasol Garage, Margate – bike licenses must be shown. reservations@dumelamargate.co.za | 039 317-3302 or WhatsApp on (083) 785-4863, valid during office hours only.